Do you have any clutter and negative, unwanted thoughts, feelings or behaviours you would like to spring clean from your mind, or your life? Imagine if you could spring clean your mind and have a mind detox? There is definitely a sense of spring in the air, a time in nature for change and growth. It’s also a time of year when many give their homes a spring clean, others tidy and get their gardens ready for the summer. Regardless of the time of year Imagine if you applied some of the same principles to your mind and your life. 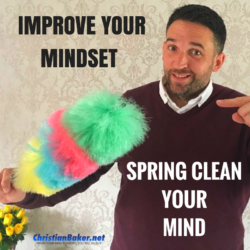 What if you could spring clean your mind, get rid of some of your mind clutter, and mind weeds? Think of thoughts, feelings and experience like seeds that grow in your mind, some grow into flowers and trees and others grow into weeds. Imagine you could develop your mindset this spring, like nature reawakening! 1 – awaken your senses, take some time to connect with nature and your senses, get out of your own head, naturally. Start by lifting your head up and look around you, as the old saying goes, stop and smell the flowers. 3 – Shift your mindset – Focus on what and who you allow into your life and your mindset. We become what we think about, so allow yourself time to focus on the good things in your life, but also allow yourself time to switch off and disconnect, mediation, mindfulness self-hypnosis are all fantastic ways to clear your mind. If you haven’t already, look to right and enter your details in the box, to grab your Free Master Your Mind e-course and get a free complimentary copy of my relax and unwind audio. And start clearing your mind. I hope you’ve found these tips useful now it’s over to you, it’s time for you to Implement these 3 tips in your life, to see how much you can clear your mind!